Acupuncture For Tendonitis, Is It Worth Trying? Should I Try Acupuncture for Tendonitis? Research shows that overall, acupuncture can be helpful to reduce tendonitis pain and increase circulation to/around a tendon. Tendonitis is a dynamic, a mechanism made up of multiple factors. Acupuncture can't deal with all the factors, but it can be helpful, and the more positives put into the dynamic, the better. Acupuncture is widely used for chronic pain conditions of all sorts. Approximately 3 million people get acupuncture in the US every year, with 'chronic pain' being the most common reason stated. There is very little research specifically about acupuncture for tendonitis, so let's look at what there is. "Compared with the exercise group, the exercise plus acupuncture group experienced significantly greater improvement with treatment. Improvements in scores by 39.8% (standard deviation, 27.1) and 76.4% (55.0), respectively"
This gives us a measure and an indication that acupuncture provided significant additional benefit. - 'Sham' acupuncture being random application of needles as a control study. A study on 17 healthy males was conducted to find out the effect of acupuncture treatment to an Achilles tendon on the UNTREATED tendon. Not only did this show that bloodflow and oxygen saturation increased to the untreated tendon (which is what they were researching), but it reported the results of acupucture treatment on the treated achilles tendon. "During the treatments (10 min for acupuncture, 20 min for heating) and recovery period (40 min), the blood volume (THb) and oxygen saturation (StO2) of the treated and the non-treated tendons were measured using red laser lights. During both treatments, THb and StO2 of the treated tendon increased significantly from the resting level." - Note that acupuncture brought up blood volume and oxygen saturation levels, but so did heat packs. In some cases of Tendonitis, actual wear and tear damage to the tendon is present, so more blood and oxygen to it is a good thing. In cases where there is no wear/tear damage on the tendon, then increased blood supply and oxygen saturation, while NEVER a bad thing, isn't going to help because 'damage' isn't what's causing pain etc. For Tendonosis, these research findings are very good, because increased blood supply and increased oxygen saturation is EXACTLY what tendonosis needs. When there is damage to a tendon (including Tendonosis), increased collagen proliferation (tendon cell growth) is a GOOD thing. Neal and Longbottom suggest that there is evidence—small in amount but high in quality—supporting the theory that acupuncture may be able to influence tendon healing by increasing blood flow via local vasodilation and increasing collagen proliferation, and that these effects are most likely the result of an increased release of the neuropeptide calcitonin gene-related peptide (CGRP) from sensory nerve endings. Does Inflammation Decrease Inflammation (related to Tendonitis)? So far there are no large randomized trials to see whether acupuncture reduces inflammation. There are few studies on it in general. Of those there are general conclusions that stimulating the vagus nerve with acupuncture causes the body to reduce inflammation. And there is study on mice showing biological mechanism of how inflammation is reduced. There is TONS of anecdotal evidence of acupuncture helping people with inflammation. 'Science' doesn't like anecdotal evidence, but I do. The Process of Inflammation is a major part of tendonitis pain and problem. Aside from trying acupuncture out, learn How To Reduce Inflammation. The first research example referred to above also concluded that 'real' acupuncture is modestly better than some guy randomly sticking needles in while you think you are receiving real acupuncture. Just like 'science' disregards anecdotal evidence, scientists/doctors/researchers really don't like 'placebo'. Western medicine believes that if you are cured from a placebo, that you really aren't cured, because placebo's aren't 'real' (even though the placebo cured a person). Point being, who cares why you feel better if you feel better? People in pain don't care about methodology, they care about results. So either way, research PROVES that (overall, generally) getting acupuncture is proven to provide results. Now again, 'results' is different than a 'fix'. Due to how Tendonitis works, it's (possible but) very unlikely for acupuncture to be a 'fix' for a tendonitis issue. Like most things, especially in health care, there is no guarantee. Most people find this site after months and years (even decades) of seeing doctors, trying what the doctors prescribe, and still getting no results. The reality is, you have to try stuff until you find something that works. Acupuncture for tendonitis results depend on you and your scenario, and the acupuncturist that you are seeing. Not all are created equal. Not all have the same education and experience. Not all 'resonate' with you and/or your problem. Trial and error. If you think acupuncture might help, then go try it out. See one or two different accupucturists a couple times. Avoid "20 sessions before we see results." You'll either notice benefits in a session or two, or you won't (you might, but I personally wouldn't keep going/shelling out the money if I didn't have a good feeling about it being helpful). To be effective, any treatment for tendonitis must reduce the Pain Causing Dynamic. Acupuncture for tendonitis might, and can, provide benefit. It's not likely to be a fix, but if you want to give it a try, go for it. If nothing else, it's worth it just for the experience. And you might get unexpected results. 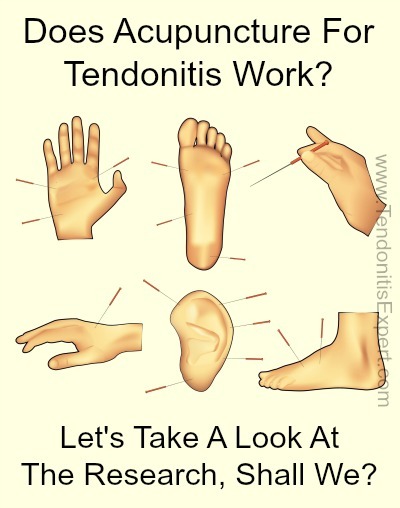 Return to the top of this Acupuncture for Tendonitis page.